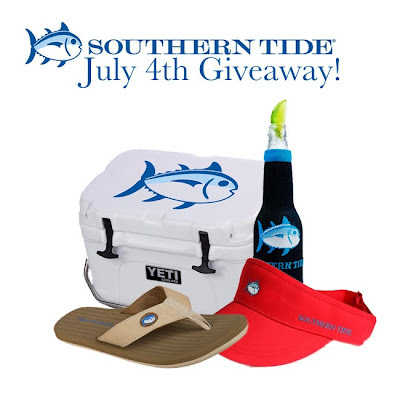 Nautical by Nature: Get Ready for the 4th: Southern Tide Giveaway! Sad you didn't win the Vineyard Vines giveaway? Well I have another fun giveaway lined up! Southern Tide has just released the new Flipjacks. Quite possibly the best men's flip flops, Flipjacks are designed specifically for those guys that spend a lot of time on the boat. They are boat-ready, fully siped, non-marking soles for sure footing. Think Sperry's in the form of a flip flop! No other flip flops like these on the market! Spending your 4th of July on the beach or by the pool? Make sure to have the Skipjack YETI cooler by your side! YETI Coolers specializes in manufacturing the best ice chests available. Whether you are boating, tailgating, rafting, or having a backyard barbeque, the YETI cooler is a must have! It is heavy duty, well insulated cooler for your outdoor needs. At the beach all day? They are great because they can stay all day in the sun and the ice inside won't melt! The winner of this giveaway will receive a giftcard for Southern Tide worth $75! Cute giveaway! I love Southern Tide! I love the skipjack polos! My husband needs one!